We are up bright and early which is impressive after a hockey game the previous night. Happily, it only had 1 OT period. Unhappily, we lost. It doesn't take long to get ready as we had laid everything out already. We walk from the Cambria Suites past the Consol Centre to Steel Plaza T station. The sky is grey with a chance of rain. It is cool and slightly windy but fine for shorts. The race starts outside PNC Park on General Robinson, it is not too crowded which is lovely. I take my Energy Bits then we head over to mill about near the start line. Some of the wind gusts are a bit chilly. The anthem is sung beautifully by a young girl with a spectacular voice. Goosebumps. Kev is just going to run with me and we'll go at a pace that feels good. I have the Garmin on so I can keep an eye on things. We're off! Running just feels amazing. We start out at 6.06/km then every km gets faster. I make sure I can still talk because, well, marathon tomorrow. This is the best run ever! We approach the Andy Warhol Bridge which will take us back into downtown. The people on the bridge are berating Kev for having a break and telling him to go on and run. As we climb the little hill the announcer advises if we want a sub-30 race we have about 30 seconds to finish. Although I know I'm there I had been second guessing my Garmin as I've never run this fast before. 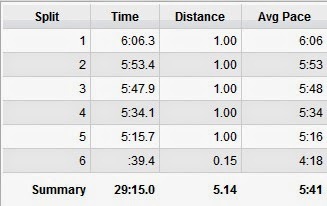 Here are my Garmin splits, I'm very very happy with this race. I earned my medal and a banana. We take a celebratory picture with Mario (and some Islander bottoms) on the way back. 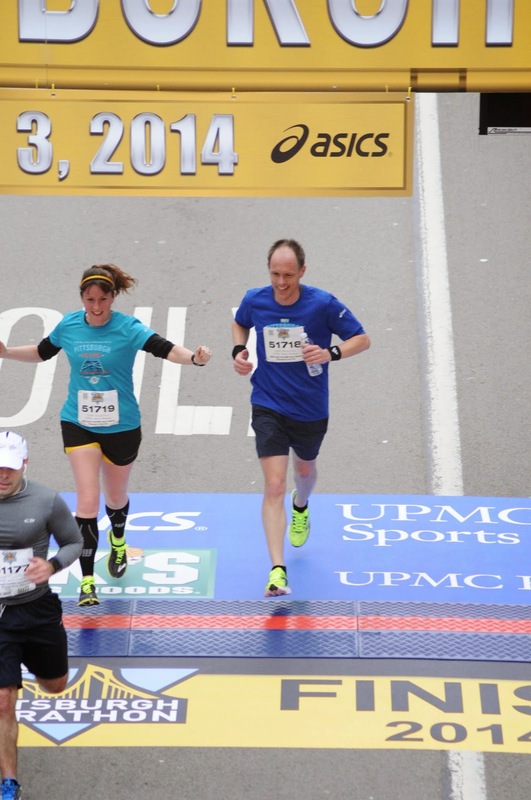 That was a fantastic way to get the marathon nerves out. I loved the route which was a point to point through some green areas with houses then over the Andy Warhol back into the heart of downtown. Official time was 29:13. There was about a 25m gain and also a 25m loss on the route. The medal is a small version of the marathon one, the details are brilliant. If you didn't see the medal at the Expo, it could be a bit of a spoiler! YAHOOO! nice 5km!! sweet. And is it super cute you two have a pic crossing the finish line together? ?